We’ve seen the Game of Thrones characters get ‘80s and ‘90s-era makeovers. 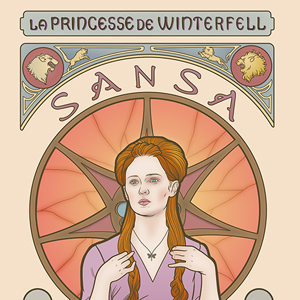 This time, a few of our favorite women of Westeros are re-imagined a la Art Nouveau. Elin Jonsson, a Swedish graphic designer, has created a series of Game of Thrones illustrations inspired by Alphonse Mucha’s famous posters from the late 1800s. Daenerys Targaryen, Catelyn Tully, Brienne of Tarth, Margaery Tyrell and Sansa are all depicted as theater posters in Mucha’s style, a staple of Art Nouveau that’s still recognizable today. Jonsson’s prints are available in a variety of mediums via Society6.